LUUMS Symphonic Wind Orchestra, more fondly known as SWO, is one of LUUMS’ larger auditioned orchestras made up of students from the University of Leeds, Leeds College of Music and Leeds Beckett University. The orchestra performs in three concerts a year: one at Christmas, one in the summer, as well as in the Auditioned Ensembles Showcase. This year SWO joined with the Symphony Orchestra for a tour to Paris which was great fun, and we will hopefully go on tour again next year! The Orchestra has previously performed many works ranging from orchestral transcriptions of Holst and Brahms, to playful film and theatre medleys, and of course works specifically written for wind ensembles. This year SWO will play a variety of traditional and contemporary works that will challenge its musicians to produce performances of the highest quality. Roaring brass, flittering winds and racy percussion – SWO aims to be fun as well as challenging, so a work hard, play hard mentality is one SWO prides itself on. Weekly trips to the pub after rehearsals and SWOcials help the ensemble to get to know one another so we can all have a great time. This ensemble may seem refined and serious on its exterior but deep down it’s a warm hub of friendship, fun and professional development. Leeds University Union Music Society, more commonly referred to as LUUMS, is one of the largest societies in the Leeds University Union. We have a history spanning back over 80 years, and something to offer you regardless of your subject of study, musical ability or taste. There are ten ensembles for you to be involved with, both open ensembles and auditioned ones, for any instrument or ability. LUUMS is committed to giving the musicians in Leeds a chance to show their talent by ensuring that each ensemble performs a minimum of 3 concerts a year. 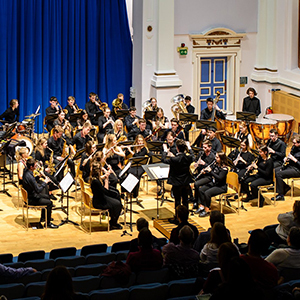 As well as individual concerts for each ensemble in venues such as the Clothworkers Centenary Concert Hall and the Leeds University Great Hall, we also host two showcase concerts for both the auditioned and open ensembles. These are held in some of Leeds’ best concert venues and are a fantastic opportunity for all involved. We also have regular Friday Feature events, held in the School of Music foyer, which are an exciting platform that gives anyone the opportunity to perform in a relaxed, welcoming environment. Alongside the diverse array of musical opportunities that we offer, LUUMS also has an exciting social calendar. Rehearsals are typically followed by a trip to Old Bar, and the year is packed full of socials for everyone to get involved in. These include large socials in the union with live music and DJs, Otley Runs, Sports Day with the University Big Band and, the highlight of the social calendar, the LUUMS Ball.